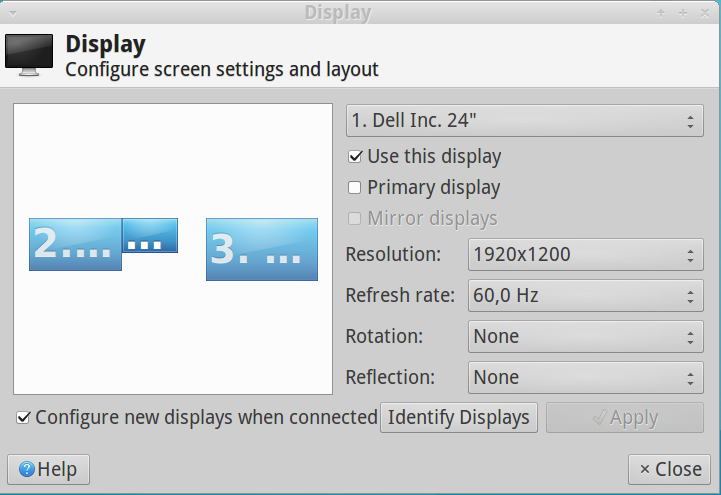 Unfortunately display settings doesn't switch on display 3 voluntary and even switches off display 1. Getting all three switched on is quite often a longish juggeling act restarting the whole x-server and clicking on "Use this display" over and over. Sometimes the screen then gets switched on for 2-3 seconds and then immediately off again just to repeat the whole mess. Interestingly enough though, the Display-Lockmanager lightdm never has any problems and starts on all three displays. Only once the xfce desktop itself starts after the login, the display or displays get switched off again and must painstakingly switched on again by the above process. Sometimes it is enough (luckly most often in the 2 display setup where display 1 is missing) just to lock the screens and to log in again (a few times) to get all displays working properly.